Seven quick hits for an unusually busy Monday in military-themed sports. Non-football links after the jump. 1. Draft history with Air Force twist. 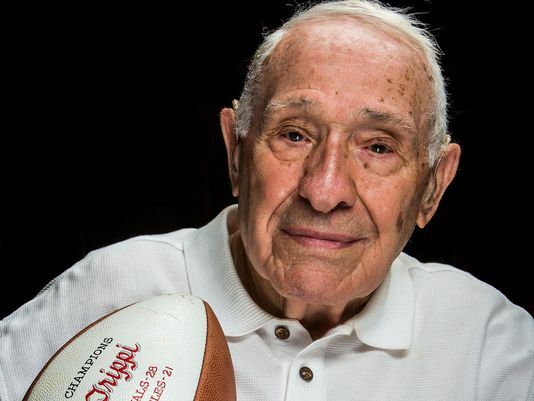 A must-read feature by our good friends at USA Today on Charley Trippi, the oldest living top NFL draft pick. The Chicago (later St. Louis, later Phoenix, later Arizona, still Super Bowl-championship-less) Cardinals drafted Trippi, star Georgia running back, in 1945, while he was serving with the Third Air Force at the tail end of World War II. Trippi, now 91, returned to college after the war and led Georgia to an undefeated 1946 season, finishing second in the Heisman balloting to this guy. He began his nine-year pro career with the Cardinals in 1947 and entered the Pro Football Hall of Fame in 1968. 2. More draft trivia. Impress your NFL draft-obsessed friends with this one: Many folks know Jay Berwanger was the first man to win the Heisman Trophy, in 1935. Some folks know Berwanger was the first man ever selected in the NFL draft, going to the Philadelphia (still Philadelphia, still Super Bowl-championship-less) Eagles in 1936. A few folks know he never played pro football — not the last time an Eagles’ draft has drawn criticism. But win the trivia contest with this: He served in the Navy during World War II as a flight officer, according to his University of Chicago obituary. 3. Wetzel’s workouts. ESPN.com says Navy linebacker Keegan Wetzel has drawn interest from four NFL teams, the most recent being the Chicago Bears. The first-team Academic All-American had seven sacks and 15 tackles for loss last year for the Mids. He was also the 2009 Chicago Catholic League Defensive Player of the Year as a high school senior, according to the ESPN report. 4. More from ESPN. From the Bill Simmons-led offshoot Grantland, to be precise — a look at the 1946 Army-Notre Dame game, which ended in a 0-0 tie and was one of many contests to carry the “Game of the Century” moniker It’s a deep dive into the politics, polls and paralyzing analysis that went into determining the college football national championship … before the BCS came along and made everything perfect forever. 5. Avila’s next step. Reports that had former Navy basketball standout J.J. Avila transferring to Richmond appear to have been a bit premature. Our good friends at Coloradoan.com report Avila will play for Colorado State after spending last year out of college basketball. Avila was the Patriot League’s top freshman in 2010-11 and led Navy in scoring (15.9 points per game) and rebounds (7.2 per game) the next season. 6. Formula One road trip. Navy Times’ Scoop Deck has the full story on F1 driver Alexander Rossi’s visit to Naval Support Activity Bahrain, complete with a miniature test track and a two-seat racer. Tires were spun. Sailors were white-knuckled. Click the link for full story and photos. 7. Coasties to the rescue. From the local-military-unit-makes-good file, our good friends at delmarvaNow.com have the story of Coast Guard chiefs and chiefs-to-be fixing up a local T-ball field. Ten units chipped in. Why the Coast Guard? This should give you some idea.